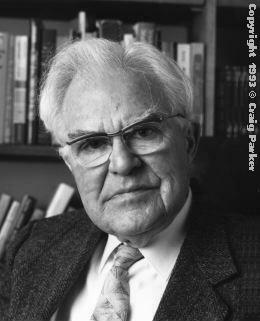 Wilfred Cantwell Smith (1916-2000), author of "Islam in Modern History." 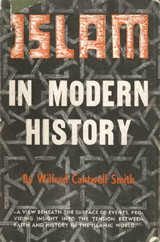 The book that most shaped my understanding of modern Muslim life was Wilfred Cantwell Smith's Islam in Modern History (Princeton, 1957). To reduce Smith's nuanced thesis to a few sentences, he argues that Muslim military, economic, and cultural success in the premodern period created an expectation that God's people would be rewarded for their faith in mundane ways. That expectation left Muslims incapable of explaining what happened when, in modern times, they fell behind in those same arenas. The fundamental malaise of modern Islam is a sense that something has gone wrong with Islamic history. The fundamental problem of modern Muslims is how to rehabilitate that history: to set it going again in full vigour, so that Islamic society may once again flourish as a divinely guided society should and must (p. 41). The trauma of modern Islam has already lasted over two centuries, with no end in sight. I presented an abbreviated and updated version of Smith's thesis in a 2000 article, "Islam and Islamism - Faith and Ideology," which included this sentence: "Whatever index one employs, Muslims can be found clustering toward the bottom-whether measured in terms of their military prowess, political stability, economic development, corruption, human rights, health, longevity or literacy." Islamists angrily jumped on this observation, though it seems rather self-evident and can be confirmed by looking at nearly any index of political openness, civil liberties, economic development, scientific breakthroughs, technological prowess, and the like. Cover of Wilfred Cantwell Smith's "Islam in Modern History/"
Based on data from the 2001 national census, the 162-page study paints a relatively bleak picture of life for Britain's 1.8 million Muslims, most of whom are ethnic Indians, Pakistanis and Bangladeshis. "Of the different religious groups, unemployment rates among Muslims were more than double those in other groups," it found. Some 17 percent of Muslim men and 18 percent of Muslim women were unemployed compared to just five percent of Christian men and four percent of Christian women. "Bangladeshi, Pakistani and Black African groups had low levels of participation in the labor market," the study found. "Their high unemployment rates suggest that even when active in the labor market they experienced difficulties finding employment." A third of Muslims lived in households which, according to the census definition, were overcrowded, compared to just six percent of Britain's Christians. Some 44 percent of ethnic Bangladeshi and 26 percent of ethnic Pakistani households were deemed to be overcrowded, against an average for the country of seven percent. In a country of nearly 59 million where home ownership is widespread and regarded as a key measure of wealth, Muslims were less likely to own their own houses than followers of other faiths. Just over half of Muslim households owned their houses compared to a national average of nearly 70 percent. The report also shows that Muslim had the highest rates of reported ill health and the largest-sized households in 2001. Statistics from 2004 show Muslim having the lowest educational qualifications. in many states Muslims are significantly overrepresented in prison. In the western state of Maharashtra, for instance, Muslims make up 10.6 percent of the population but 32.4 percent of those convicted or facing trial. In the famed national bureaucracy, the Indian Administrative Service, Muslims made up only 2 percent of officers in 2006. Among district judges in 15 states surveyed, 2.7 percent were Muslim. Educational disparities were among the most striking. Among Muslims, Mr. Shariff said, the literacy rate is about 59 percent, compared with more than 65 percent among Indians as a whole. On average, a Muslim child attends school for three years and four months, compared with a national average of four years. Less than 4 percent of Muslims graduate from school, compared with 6 percent of the total population. Less than 2 percent of the students at the elite Indian Institutes of Technology are Muslim. Equally revealing, only 4 percent of Muslim children attend madrasas, Mr. Shariff said. The gaps in employment are likely to be among the most politically explosive. Muslims appear to be overrepresented in the informal sector of day laborers and street vendors and underrepresented in the public sector. Muslims secured about 15 percent of all government jobs, considerably less than the share filled by "backward" castes and Dalits, those who were considered "untouchables" in the Hindu caste system. Islamic economy is based on Western economic theories. They borrow these theories, strip them of their original names, and give them names in accordance with the shari'a. Thus, it becomes an Islamic economy. All we do is cut-and-paste. At present, Muslim-majority countries overall are among the poorest in the world, as measured by gross domestic product (GDP) per capita in U.S. dollars adjusted for purchasing power parity (PPP).13 Their median GDP per capita of $4,000 is substantially lower than the median for more-developed countries ($33,700). Feb. 13, 2014 update: In a brilliant analysis, "Islam's Second Crisis: The troubles to come," Mark Durie sees the Islam's encounter with the West as its first crisis and argues for the failure of Islamism as the second crisis. I'll leave the second crisis to another discussion (it's a topic I plan to write on) and limit the topic here to his review of that first crisis. promises falah "success" to the religion's followers, symbolized by the daily call to prayer which rings out from minarets: "come to success, come to success." The success promised by Islam has always been understood to be both spiritual and material: conquest and rule this life, and paradise in the next. The Qur'an states that Allah has sent Muhammad "with the guidance and the religion of truth, that He may cause it to triumph over all [other] religions" (Sura 48:28). Islam's theology of success meant that the global failure of Islamic armies and states at the hands of "Christian" states constituted a profound spiritual challenge to Islam's core claims. Just as Muslim scholars had always pointed to the military victories of Islam as proof of its divine authority, this litany of defeats testified to its failure as the religion of the successful ones. Durie notes two elements to this crisis: (1) "for five centuries from around 1500, Western powers were pushing back Islamic rule" and (2) Islam's "position of dominance within its own borders was also being challenged," by which he means that "there were in many places improvements in the conditions experienced by non-Muslims under Islamic rule – a weakening of the dhimmi system – which communicated to Muslims an impression of their own faith's loss of dominance and its loss of 'success'." The gradual process of improvement of conditions for Christians and Jews under Islam was regretted by Muslim scholars, who saw it as evidence of Islam's decline. For example a request for a fatwa from a Egyptian Muslim judge in 1772 lamented the "deplorable innovations" of Christians and Jews, who were daring to make themselves equal to Muslims by their manner of dress and behavior, all in violation of Islamic law. How many universities are there in the Muslim World? How many Muslims gone to space so far? How many Olympic Gold Medals won by Muslims so far? How many Nobel prizes won by Muslims so far? How many PhDs are awarded by the Muslim World in a year? How many cars produced by the Muslim World in a year? How many Children aee out of school in the Muslim World? How many supercomputers are there in the Muslim World? What is the representation of Muslim Universities in 'World University Ranking' What were the GDPs of all Muslim countries of a year? And many other striking facts you will find in this book. In every field you will also find the data of all other leading countries in that field so that you can easily compare the standard of progress of Muslim countries with other leading countries. Mar. 19, 2018 update: Zubair Zafar Khan has kindly sent me an update to the 2014 volume, this one titled Muslim Progress: Index A. It is available for downloading here.